ItemF-08537 - The Gorge - V.A. [Victoria Arm] - V.I. [Vancouver Island] B.C. ItemA-00276 - Officers group of H.M.S. Zealous, Admiral and Mrs. Hastings. ItemE-09946 - The band of the Victoria Volunteer Corps. ItemB-03803 - Indian Chiefs B.C. ItemF-08321 - Sooke [T'souk-e] Indian woman. MS-3100, Album 4, Page 10. 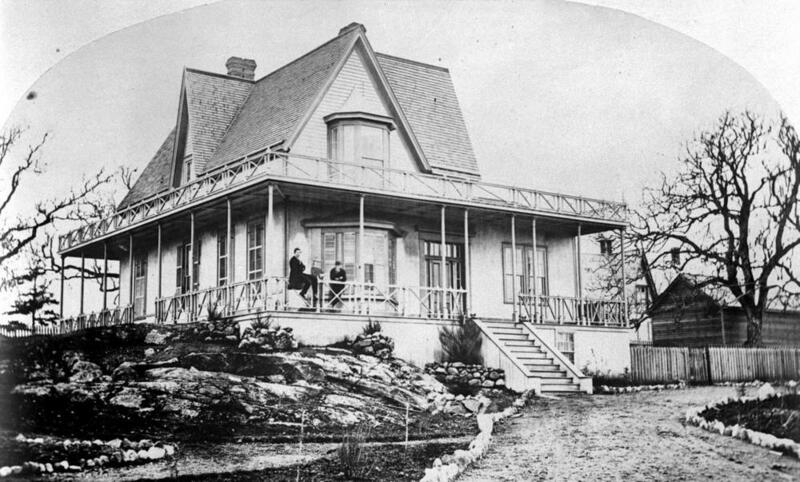 The home (1462 Rockland Avenue) was owned from 1865 to 1870 by Vancouver Island Chief Justice Joseph Needham and so it may be the Needham family in this photograph.